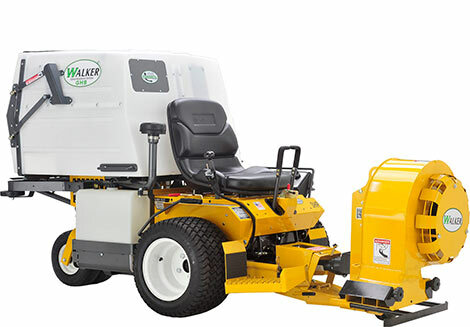 Five implements mount interchangeably on the Walker Mower using the quick-change hitch system. The Implement Hitch replaces the mower deck and installs on the tractor in less than a minute. Implements then slide onto the hitch and lock in place with the flip of a lever for true “quick change” capability. 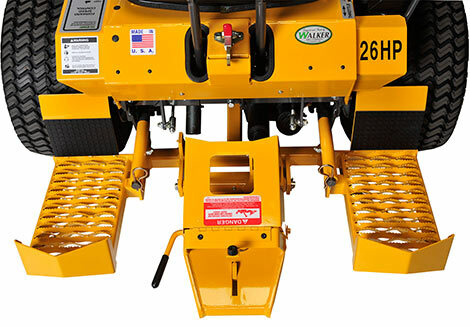 The hitch assembly includes operator footrests and an electric power lift. A switch raises and lowers implements and is quadrant mounted on the Forward Speed Control lever for convenient operation. Bringing additional versatility to the Walker is the 46″ Dozer Blade. Often used to remove snow from sidewalks, it is also powerful loose dirt and gravel mover. The Dozer Blade features five-angle positions and a spring trip action for protection when hard objects are encountered. 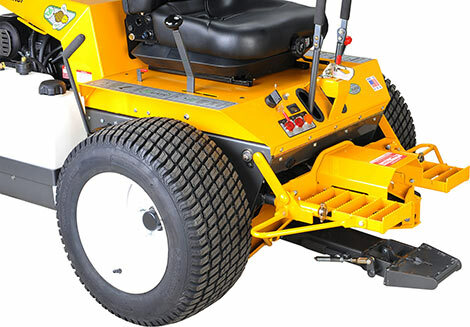 It has a high-strength, replaceable steel edge, and as with all Walker Mowers implements, mounting the Dozer Blade is a simple and quick process. A versatile tool for landscaping work, the Loader Bucket will push, scoop, haul and grade dirt, stone, gravel and mulch. It lifts approximately 180-lbs and 2-1/4 cubic feet of material, and features 14″ ground clearance for transport. The Loader Bucket has a high-strength steel cutting edge with tilting action, and is powered by a 500-lb electric ram, and is available for use on each Walker Mower except models MB and MBS. This hard-working implement adds great value to the investment made in a Walker riding lawn mower. 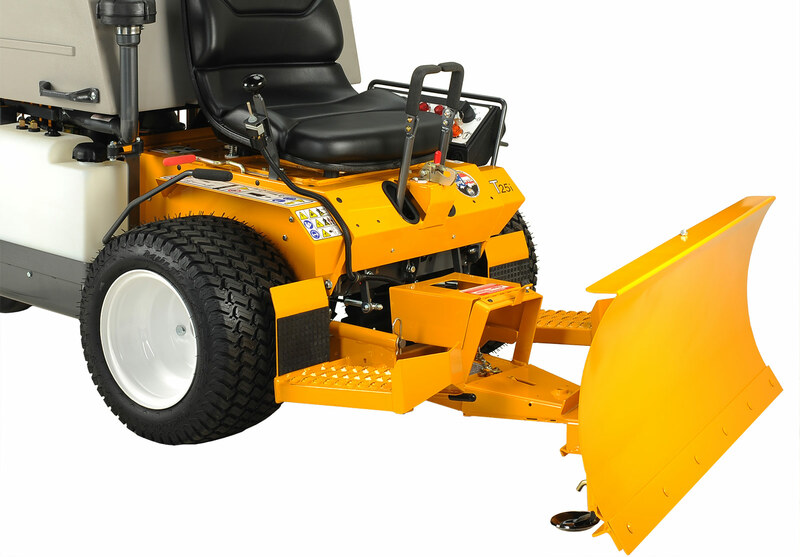 A powerful 42″ two-stage snowblower is available for MC, MD and MT tractors. 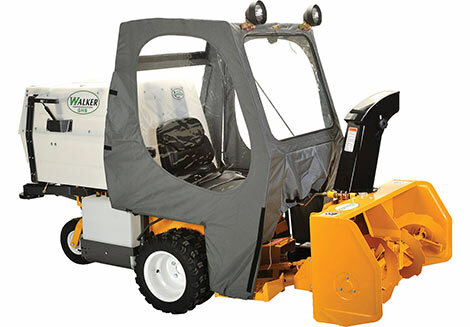 Quick, easy operation is enhanced by a power lift and includes the ability to adjust the discharge spout 180 degrees from the operator seat to throw snow up to 40 feet. The optional Operator Soft Cab is recommended to offer protection from the elements. 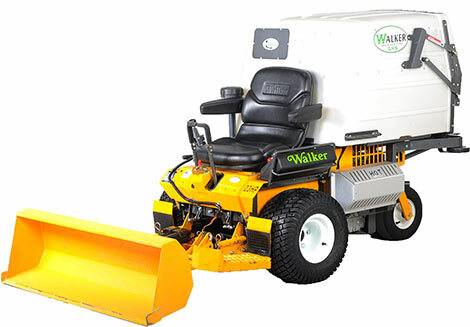 The two-stage snowblower is one of Walker’s most popular implements and extend the earning potential of lawn mowing companies to include the winter months. The Rotary Broom, with a 47-inch sweeping path and five position angle head is ideal for sweeping debris or light snow from hard surfaces. The Rotary Broom does a great job of sweeping and removing gravel and debris from turf areas along roads, paths and playing fields. Down pressure is spring weighted and is adjustable for great sweeping action and minimum brush wear. The Rotary Broom is another way to extend the usability of your Walker commercial riding lawn mower. Another implement for the Walker Mower is the Debris Blower. Useful for landscape clean-up and leaf removal, the Debris Blower quickly mounts to the tractor and gives the Walker Mower owner full three season use. The 13-1/2″ Debris Blower delivers 125-MPH velocity and a 230 degree manual directional control. The same high quality construction found in each of our commercial mowers is built into this and each implement we offer. The Debris Blower is available for use on each model except MB and MBS. Three quick-change implements easily interchange on the H-series using the Implement Hitch Mount. The Implement Hitch replaces the mower deck and installs on the tractor in less than a minute. Implements then slide onto the hitch and lock in place with the flip of a lever for true “quick change” capability. The hitch assembly includes operator footrests and an electric power lift. A switch raises and lowers implements and is quadrant mounted on the Forward Speed Control lever for convenient operation. The MH tractor becomes even more versatile with the 60″ Dozer Blade. Great for removing snow from sidewalks and driveways and it is also a powerful tool for moving loose dirt and gravel. The 60″ Dozer Blade features a five-angle positioning and a spring trip action for protection when hard objects are encountered. A high-strength, replaceable steel edge is standard. The dozer blade mounts easily on the H-series Implement Mount Hitch. 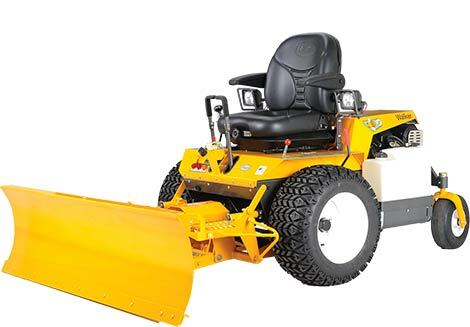 H-series tractors can stay busy in the snow when attaching the 50″ two-stage snowblower. 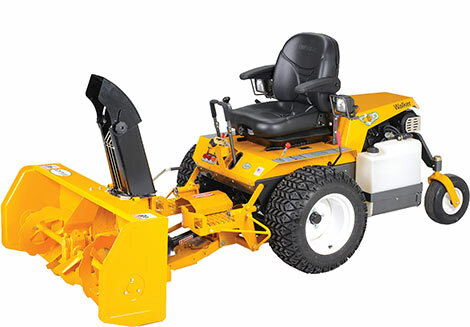 This powerful, easy-to-operate implement uses a power lift controlled by a toggle switch on the Forward Speed control. The direction of the discharge spout can be adjusted 180 degrees from the seat, and the trajectory of the top of the discharge spout can be adjusted to throw snow up to 40 feet. A replaceable, hardened steel scraper provides good clearing action. 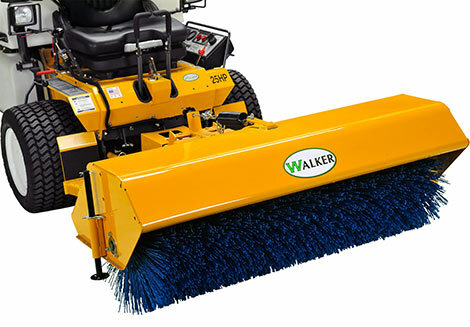 Light snow and debris on hard surfaces are easily swept away with the 60″ Rotary Broom. 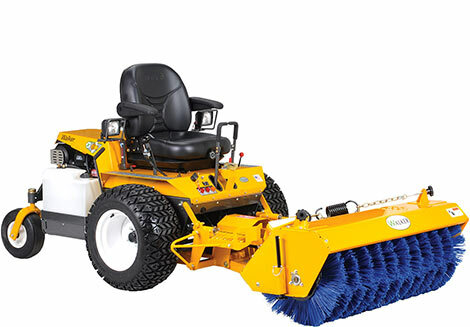 The five-angle position head helps the Rotary Broom do a great job of sweeping and removing gravel and debris from turf areas along roads, paths and playing fields. Down pressure is spring weighted and is adjustable for great sweeping action and minimum brush wear.